“Spitzer bullets all fall into one of several different design types. A bullet’s geometry can be broken down into symmetrical sections. The body (or shank) of the bullet is that part of the bullet that comes into full contact with the barrel rifling. It is the cylindrical portion of the bullet of nominal groove diameter for that caliber. It is also referred to as the Bearing Surface. The term “Ogive” is commonly used to describe that specific point where the curving part of the bullet nose begins–i.e. where the bearing surface ends and the curved part begins. When we talk about “bearing surface length”, this is the distance from the top of the boattail to the point where the bullet starts to curve. However, the terms “ogive” or “ogive profile” are also used to describe the entire forward curved section of the bullet, ahead of the bearing surface. The Ogive Profile, or nose of a bullet, can be one of three varieties, two being common*. The ogive can have a tangent radius; that is, the intersection of the body of the bullet and the radius of the ogive blend together at a tangent point. This is the most common type and is typical of most bullets handloaders use. The other common type is the secant ogive. In this case the intersection of the ogive and bullet body does not flow together smoothly. The point of intersection is not tangent, the ogive radius being a secant of the arc circle of the ogive. The radius of the ogive is generally given as a multiple of the bullet diameter. For example, a 30-caliber bullet might have a 7-caliber tangent ogive. That is to say that the radius, in inches, is seven times .308 or 2.156 inches. When a bullet is described as “7 Ogive” this is what is meant–the radius of the bullet’s nose section as a multiple of the bullet diameter. 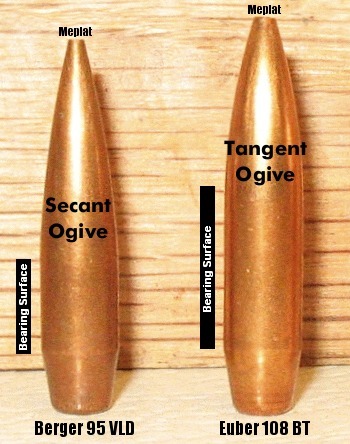 (A “7 Ogive” can be any caliber, not just 30 caliber–it is the ratio of the curve radius to diameter that counts). The point or tip of the ogive is called the Meplat. This can vary in diameter from about .050″ to over 0.125″ for conventional spitzer-type bullets. *The third bullet nose type is a cone. Cone-shaped bullets are not common with handloaders, but some experimental work is done with them. Share the post "Bullet Design–Secant vs. Tangent Ogive"
Share the post "Easy, Economical Length-to-Lands Gauge"